My little brother is a lucky ducky. He graduated this weekend, and my parents threw him a party. I, of course, was elected to help out with this and that… and then, this and that. I’m worn out from being a busy bee this weekend. Nonetheless, congratulations to my little brother for finishing up college! My mom and I waited outside before the commencement ceremony began. Gloria hates getting her photo taken! I, of course, made her do it anyways. Aren't I the nicest person?! Here's Sean looking up at the family right before he graduates! 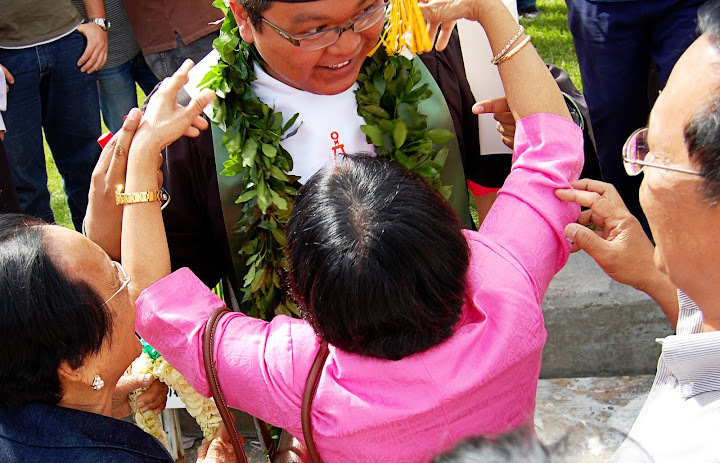 Our family from Hawaii gave the graduate beautiful leis. It's a tradition! The proud Mommy of a college graduate. It's gotta feel great for her! My GORGEOUS cousin, Nicole! She grew up way too fast! A big congratulations to the winner! Please email me at redoaklines@gmail.com to claim your prize! Make sure to hit up the Imaginisce blog this week. 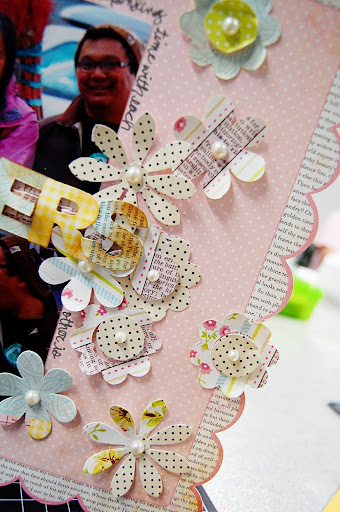 Core’dinations was super generous and sent all of us tons of cardstock to use! To win products from both manufacturers, check the Imaginisce blog for details! Hopefully, I will see you all back here tomorrow. ¡Felicitaciones a la ganadora! bhuaaaaa, otra vez será!! Sarah, qué dulce tu mamá (parece tu hermana mayor!) y felicitaciones también para el egresado ¡qué orgullo! Congrats Sean! Rest up, Sarah. 🙂 I can’t wait to see what you have planned! Congrats to your brother! Fab sneaks! Congrats to your brother! My sister graduates high school in 2 weeks and I am beside myself about it! I can’t believe it!! 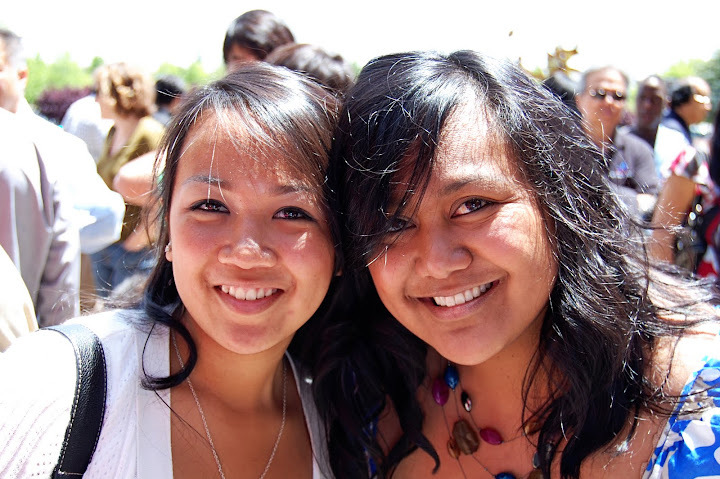 Her and I are 14 years apart, so I feel so old to think that the girl who was 4 when I went to college is graduating. Can’t wait to see what else you have up your sleeve, lady!!! Congrats to your brother and your family!!! Fabulous photos. Congrats to your brother. Love the sneaks. Can’t wait to see what you have in store for us. Fun photos! Your mom’s top is pretty! Wow, you did have a very busy weekend congrats to the grad and what a great sister to help out so much. Your sneak peeks look great can wait to see the whole thing. I cant wait to see your new projects! AND too cool that youve sewn things for yourself before, i didnt know that!! Congratulations to your brother! All his hard work has paid off! 🙂 It’s such a wonderful feeling to know that you accopmplished such an important goal! no! i am not pregnant!! 🙂 hahaha. Congratulations to your brother, and those sneaks look fantastic! These are awesome grad photos!!! Your family so ROCKS!!! Sarah, looks like the ceremony was beautiful, and it is always nice to get family together! Love the photos. Such a proud moment for all! Nice post about your family. It would have been better if some people weren’t so ________. Your parents are hilarious. beautiful family, looks like terrific day! 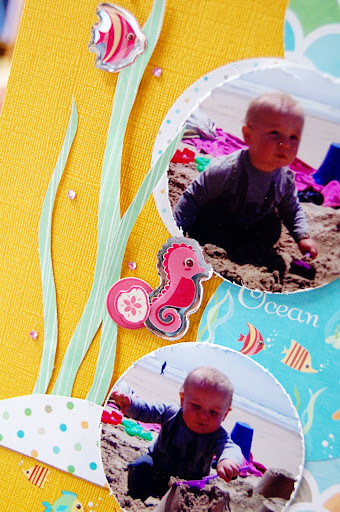 Oh my goodness, I LOVE your Splash Dance layout – I’m totally going to need to scraplift that one! Great graduation photos too!